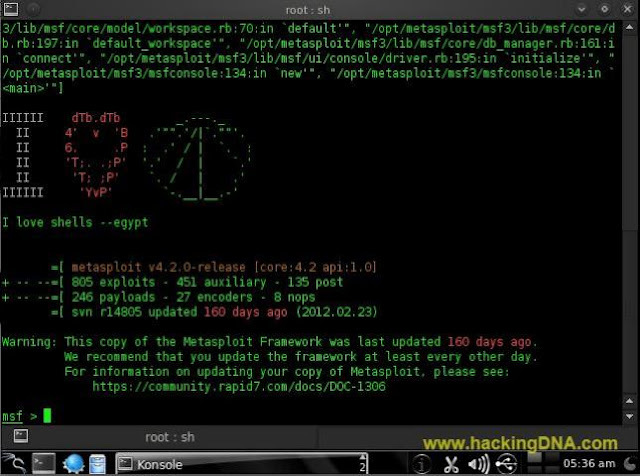 In this tutorial we are going to use NMAP ( Network Mapper ) with MSFCONSOLE . We are going to learn how can we use nmap in msfconsole on backtrack . For penetration tester nmap is a very helpful tool , which provides different modes of scanning the target system. We are going to do different types of scanning like TCP connect scan ,SYN scan , UDP scan , ACK scan , OS scan , Version Detection Scan and Spoof scan with examples . And all this done on msfconsole. It's a easy and interesting process of Information Gathering .So without wasting time lets start the MSF scanning . First the simple process launch the msfconsole , to do that follow the steps on Backtrack 5 . Now your msfconsole is open and you can see a beautiful I LOVE SHELL banner is displaying in this image . You also get a random banner . Next step is type nmap . To invoke nmap , type nmap and as you press enter , it display the list of scan options . As you can see in the below image . Here in the below image you can see there is a list of target specification , scan types and various other options. Your work is to understand all this , don't directly jump on the commands execution . This scan is used to detect open ports on the target machine , it follow the three way handshake process . Here -sT parameter means we want to perform a TCP connect scan . -p parameter means range of ports to be used , in our example , we have given the range from 1 - 2000. The advantage is after a complete handshake process , it display all the open ports ,which you wan too see . It shows the accurate results . Now the biggest disadvantage is , it is easily detectable by IDS (Intrusion Detection System ) and IPS( Intrusion Prevention System ). Syn scan is also known as Stealth scan . It is also known as half open scanning because it never forms a complete connecttion between the target and the scanner machine . Difficult to detect by the firewall IDS And IPS . These days updated , new mordern firewalls can detect and capable to catch the syn scan. This techniques is used to detect the open ,closed and filtered UDP ports . Suppose i sent a Udp packets and the station responds with the ICMP : Port Unreacheable, it means the post is closed . 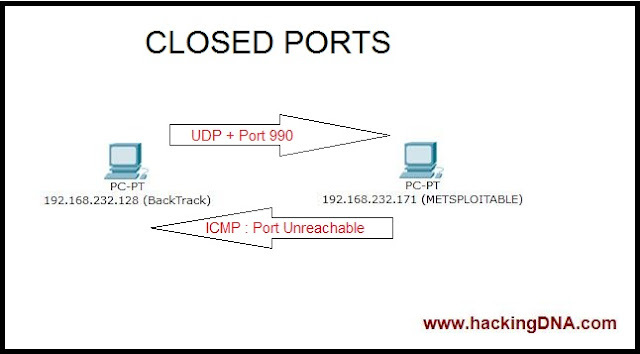 In case of filtered open ports , we send the UDP packets from BackTrack to Metasploitable target machine . 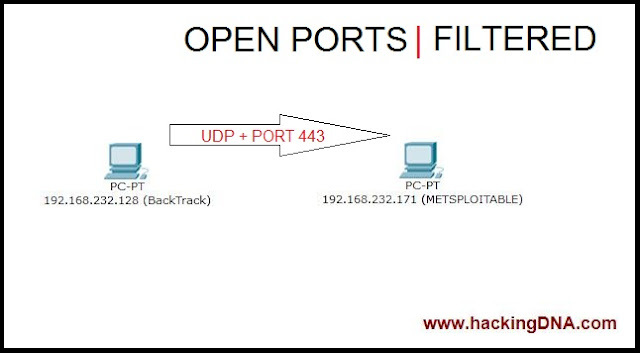 If there is no respond from the target (Metasploitable) machine , then it means the port is open but filtered . You can see this in our example . 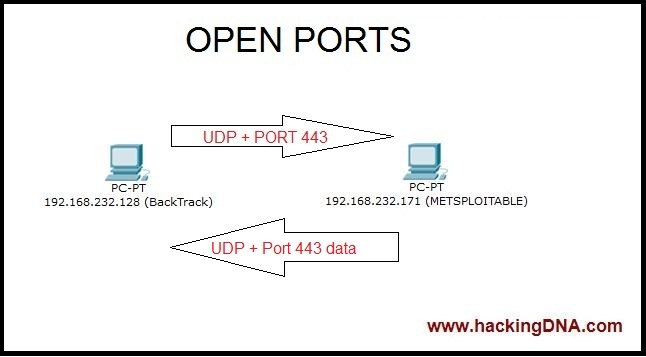 For open ports if there a reply comes back to backtrack 5 machine , then it is considered to be open ports . SO According to the above scan operations , here is the actual example of the UDP scanning through msfconsole. In the output you can see the open and open|filtered ports . It tells that whether the target machines ports are filtered or unfiltered by a firewall . It sends TCP ACK frames to remote port and if there is no response then it is considered to be filtered . And if it responds with a RST ( RESET) then it is considered to be unfiltered port. The below example shows that the target machine has unfiltered ports . Through this scan we can identifying the target Operating system . In this example , it shows the target OS is Microsoft windows . See the below example and analyse it , how it can scan OS . It can detect the open ports and the what version of services the target system running. Now , this scan is used to make some anonymity on the firewall logs . Nmap has a features called Decoy[-D], this features will not prevent you to be get recorded on the firewall logs but in this features we can add two more fake /spoof ip addresses that create a log file more complicated . When the administrator look that logs , it shows that there are several other machines that scan at the same time . Now when the it execute the command , it shows all the target details , but on the firewall logs it confuse the administrator with the fake ip addresses a little bit . See the below example and understand carefully . THIS IS HOW WE CAN PERFORM NMAP SCANNINING IN MSFCONSOLE , I HOPE YOU LEARN A LOT FROM THIS TUTORIAL AND CLEAR YOUR BASICS UNDERSTANDING BETWEEN THESE SCANNING TECHNIQUES . HOPE YOU LIKE IT DON'T FORGET TO JOIN OUR FACEBOOK PAGE WHERE YOU CAN SHOUT ANY QUESTIONS AND YOU WILL GET THE LATEST UPDATES .